A "hybrid" pipe organ is a blended instrument, a pipe organ made up of part real pipe ranks and part digitally generated electronic ranks. Good idea? ... that depends upon the nature of the mix, who you talk to, the set of "facts" they're working from, and if they think the sacrifice is worth it [See blog, An Even Better Movie]. The better argument in any debate isn't always the one that wins the day. There are a number of organists and organ builders who view the term "digital organ," like "electronic organ," by name, as an oxymoron, technically. They feel that an instrument is either an organ or it isn't, and, if it isn't, it's in the same category as "plastic flowers." They're convinced that 2 ranks of reality is better than 100 ranks of "anyone's tuned buzzers." Actually, they have a point. In a hybrid organ that's largely digital, the digital stops don't always blend well together with the pipes and can be out of phase with them, not to mention the fact that the pipe sounds are the only ones in the instrument that are acoustically coupled to the air in the room. When elements like this are unequally yoked together it can be quite challenging to get things in tune this way, keep them in tune, and keep the blended stops used in ensemble from sounding like a chance meeting of color specialists who are not on speaking terms with each other. On the other hand, advocates of digital electronic organs also have a point: digital voices can be employed to give a pipe organ some additional power and versatility, especially in the Pedal division where a few additional digital stops, especially those of 32-foot pitch, can be very useful and advantageous in situations where space or funds are lacking for placement of real pipes. The reality therefore, is that, under certain conditions, and when designed with good judgment, an organ that is both pipe and digital can work. Generally, if all we have is a digital organ on which to perform, we settle for it, but we very much prefer the basics of a good pipe organ, knowing that any digital voices, if present, are being employed sparingly for the purpose of simply enhancing those basics. When discussing this and other controversial issues among organists and builders, it's good to remember that many subjects like this are often tied to the emotions and can be provocative, even inflammatory, due to the fact that one man's thesis in a debate can mean another man's livelihood. Here's a reminder: avoid flames ... critique principles, not people ... be discriminating, but not nitpicky ... be academic, not acerbic ... be principled, not polemic. The more digital ranks that are added to a pipe organ, the more difficult it becomes to get it to sound good with itself. The Castro Theatre in San Francisco, California, is a case in point. 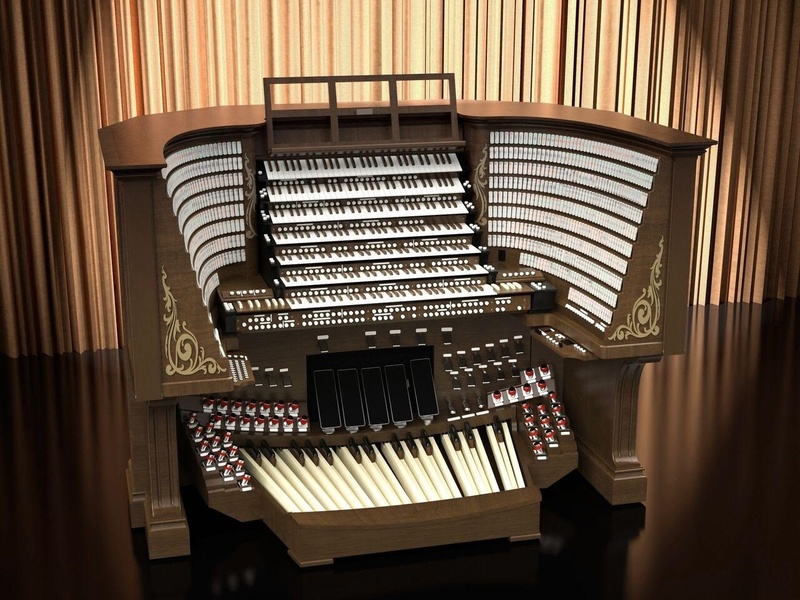 When completed, the symphonic theatre organ being built for this theatre (photo shows mock-up of the new console) will be the largest hybrid pipe organ in the world, with over 800 stops. At its core is the original 21 rank Wurllitzer theatre pipe organ of around 150 stops of the Castro Theatre reduced to 16 ranks and playable from a new 7 manual console. This will be augmented with 16 new classic pipe ranks, shared by 2 divisions, and over 400 new digital organ and orchestral voices. As such, it will be very tricky getting these hundreds of digital voices to sound in tune, in phase, and blend together, keeping it that way, with the 32 ranks of real pipes. One of the sacrifices made to create wonders like this is, with the addition of this many digital voices, a new, larger console is needed, leading to the removal of many old, original consoles that can never be replaced, with the result that these precious, priceless pieces of national, historic organ building are lost to future generations. And, with 5 of its 21 ranks taken out and its original console removed, if the mighty Wurlitzer of this theatre could still speak as originally conceived, the song the old girl would be singing now would be "I Lost My Parts In San Francisco." As this theatre replaces an iconic part of its history with a gigantic piece of tech, it's a one way trip which will be hailed, initially, as a musical marvel, a triumph of modern engineering. But it could also, in time, leave the ears of theatre patrons and performers longing for the full color and diversity of the original instrument built by Wurlitzer as more of these original landmark instruments from the golden era of theatre organ playing fall silent or disappear one by one. It could leave nostalgic theatre patrons officially satisfied but wishing, privately, that promoters of projects like this had kept the mighty Wurlitzer fully intact as it came from the factory, and that they had just wrestled with it. It's happened before, that a decision like this was made by senior administrative clergy, to remove and replace a fine, old pipe organ needing maintenance with a smaller, more expensive, brand new pipe organ, which left the local clergy in charge of the instrument officially satisfied, but privately very unhappy. As for the creators of an untested amalgam, if their best efforts should not turn out quite like they expected, all they can do is live with their regrets, a subject previously explored in literature and in the motion picture industry [See blog, An Even Better Movie]. As far as what it will be like to play this new instrument, to have this much tonal spread at one's command, to have this much mix of theatre organ, classic organ, and symphony orchestra to keep separate, and to have such a colossal affair to operate, it will be an absolutely mind blowing experience, one which will require, if it were possible, many hands, many feet, and many brains.